Making fun of modern art can be, well, fun. Anyone who tells you otherwise is selling something — probably modern art. Pretentious artist statements and unconscionable price tags only make matters worse. Joking aside, though, a lot can be learned from contemporary works and the personal and public responses they provoke. The conversations that arise — about value, beauty, skill, intellectualism and money — are integral considerations of what an artwork has to offer. On Wednesday, April 6, Champlain College professor David Mills will dive headfirst into the morass of those considerations with his free talk "That's Art?" The lecture and guided conversation at ArtsRiot in Burlington's South End is presented in conjunction with the Ideas on Tap series offered by the Vermont Humanities Council and the University of Vermont Humanities Center. "What I'm really interested in," Mills says by phone, "is less What is art? than How and when and where and why do different perspectives on material culture and experience become labeled [as] art? Mills will draw on some 20 years of teaching experience, including the course he currently offers at Champlain called Aesthetic Expressions. He asserts that the event will be "interactive" — more seminar than lecture — and audience participation will be encouraged as he introduces progressively more challenging works of art. 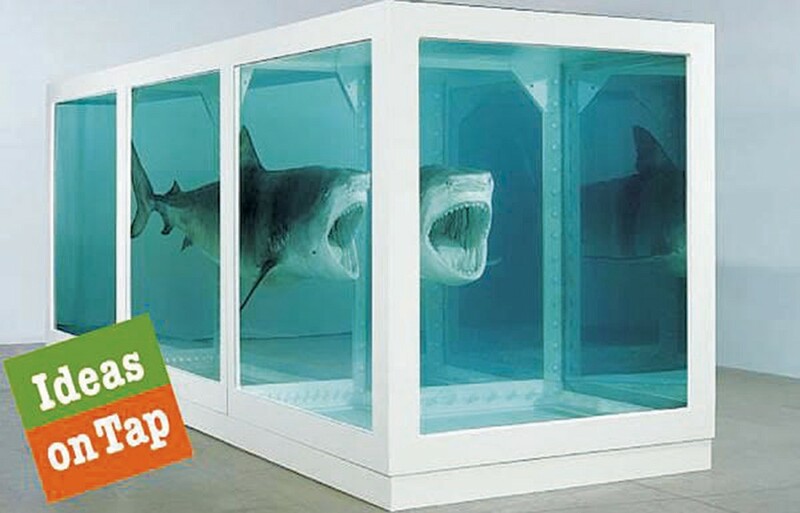 Two such works are Marcel Duchamp's 1917 "Fountain" and Damien Hirst's 1991 "The Physical Impossibility of Death in the Mind of Someone Living." The materials of the latter are listed as glass, painted steel, silicone, monofilament, shark and formaldehyde. "We're taking a leisurely approach," says Mills, "[and] trying to foster as much interaction, discussion and community around the topic as possible." He anticipates meeting salon-style for a couple of hours, with ample "small, talk-amongst-yourselves-type breaks." "That's Art?" is the first of three Ideas on Tap events this year. "The main idea behind these sessions is [to tap] into those awesome professors that many people remember from college," says Amy Cunningham, VHC's director of community programs, by phone, "and [to give] adults ... a chance to engage in an informal way around provocative contemporary topics." This is the program's second season. As for making fun of modern art: Sometimes laughter really is the appropriate — and even desired — response. The original print version of this article was headlined "Art on Tap"